and from a report by Ben Au, Pauline Cheng, and Corrine Tan dated December 15, 1994. Oroville Dam is located on the Feather River, nine miles east of Oroville, CA, located in the Sierra Nevada Foothills 75 miles north of Sacramento and 60 miles south of Redding. The coordinates of the dam are 38° 35.3' North Latitude and 122° 27.8' West Longitude. From Sacramento, travel north on Interstate Five. In approximately three miles, turn off on Highway 99 north towards Yuba City. After 13 miles, take Highway 70 north towards Marysville. Oroville is 48 miles north on Highway 70. Take the second exit off the highway at Oroville Dam Boulevard (also Highway 162). Turn right on Oroville Dam Blvd. heading due east. Follow Oroville Dam Blvd. through town and in approximately nine miles the spillway and dam will be visible on the left hand side. Climb the hillside to the right of the dam, turn left at the stop sign and drive on top of the dam for spectacular views. One can also go straight through the stop sign and follow the green painted roadway stripe up to the Visitor's Center. Oroville Dam is currently owned and operated by the State of California Department of Water Resources. For a tour of the Edward Hyatt Powerplant and/or the Feather River Fish Hatchery facilities contact John Ford at (530)534-2306. Tours are scheduled on a first come-first serve basis, and generally given in groups. Tours are free of charge. Allow two hours for the tour of the dam facilities and one hour for the fish hatchery. Construction began in 1961 and was completed in 1968. Total volume of embankment: 80,000,000 cu. yd. Power producing facilities at Oroville Dam include Hyatt Powerplant, Thermalito Powerplant, and Thermalito Diversion Dam. These facilities operate together to move water and to generate electricity. The energy produced from these plants is partially used to offset the operating costs. Currently, Southern Cal Edison has contracted with DWR to purchase excess electricity. In 1940, studies were done to determine where to construct a dam along the Feather River to act as a major water storage facility for the California State Water Project. In 1960, voters approved a bond issue to begin construction of Oroville Dam. The earthen dam was chosen for economic feasibility. The supply of tailings was hauled in by the railroad from impervious core material that could be found less than ten miles away. Workers then added 23 miles of railroad to move the existing railroad tracks out the the path of the reservoir. The relocation of the railroad required building three new bridges and five tunnels. Actual work on the dam began in 1961. The two diversion tunnels and initial dam were completed before the winter season of 1964-65. The embankment of the final dam was completed in 1967, and the spillway was finished in 1968. The power plant and cleanup of the site were finished within the next two years. Two diversion tunnels were constructed for diverting water around the construction area. Diversion #2 is now used as an outlet for the water being utilized by the underground power plant. The 35 foot diameter size of the tunnels was chosen to withstand the flows of previously recorded floods on the Feather River. After final completion of the dam in 1967, Diversion Tunnels #1 and #2 were plugged. They excavated a system of tunnels for the powerhouse, some of which connected to Diversion Tunnel #2. The Oroville-Thermalito Complex is a peak operating facility. There is coordination between releasing water and producing power, where releasing water takes precedence. During normal operation, a 24-hour supply of water is squeezed both plants during a peak 6-10 hour window of the day when power production is most needed. The water is then stored in Thermalito Afterbay, a holding reservoir located beneath the Thermalito facility. A primary purpose of the Dam was to provide flood control. 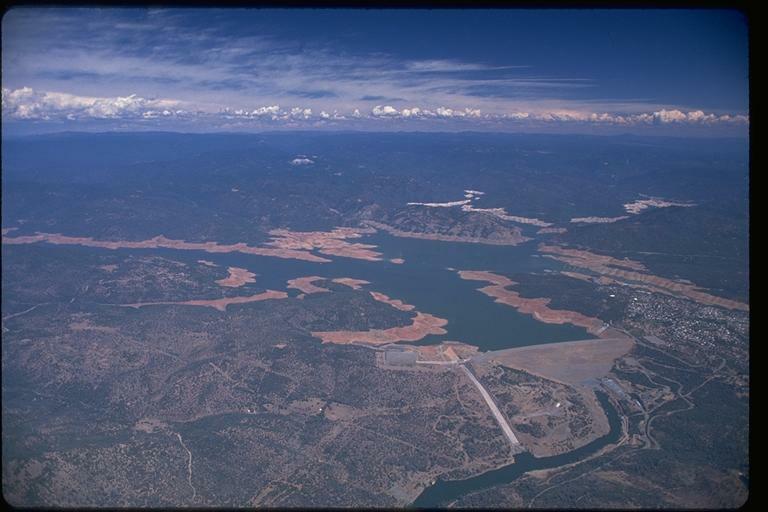 As the lake fills during heavy rains or large spring snow melts, water is carefully released to prevent flooding downstream, saving both lives and costly property damage (DWR, Oroville-Thermalito, 1991). The dam mainly protects Butte County and area along the Feather River from large flooding. Floods occurred every few years, costing the residents of the area millions in damages. For example, in December of 1955, the largest flood to date caused damages along the Feather River in excess of $82 million (Report on Reservoir Regulation for Flood Control). Oroville Dam is a major water storage facility for the State Water Project (SWP). The dam releases an average of 2.8 million acre feet (MAF) of its total capacity of 3.5 MAF. Water deliveries made to Butte and Plumas County in northern CA and to the lower San Joaquin Valley (Kern, San Bernadino, King and Riverside Counties) in southern CA are mainly to irrigate agricultural crops. Eighty-five percent of the water demand in the San Joaquin Region is for irrigation with twenty-nine percent of the water supply coming from imported State Water Project (SWP) deliveries from Lake Oroville. This imported water is crucial to prevent groundwater supplies from becoming severely depleted. Additional water supplied by Lake Oroville is delivered to counties to the South Coast Region. Some of the water is used for environmental concerns. The water is used to maintain the Feather and Sacramento Rivers and the San Francisco-San Joaquin delta. The water for the Delta is used to increase the water quality by lowering the salinity levels. Additionally, the extra water helps restore the habitat for the Delta Smelt and Chinook Salmon (DWR, Bulletin 160, 1993). The construction of the dam made the upper portion of the Feather River inaccessible to migrating salmon and steel head trout who used it for spawning grounds. To make up for the lost spawning area, the Feather River Hatchery was constructed. Funded by DWR and the Department of Fish and Game (DFG), DWR maintains the facilities while DFG staffs and operates it (Ford, 1964). It can accommodate 9000 adult salmon and 2000 adult steel head. The incubator can hold 20 million eggs and 9.6 million fingerlings can be reared in the 8 concrete raceways (DWR, Bulletin 200, 1974). Historically, the majority of the steel head and salmon spawn below the Oroville Dam. Currently, approximately 20% spawn in the hatchery and 80% spawn downstream (Ford, 1994). The hatchery has been very successful due to the carefully monitored flow of water. To keep the recreation areas fully functional with the low water levels due to drought. Numerous faults were mapped in the foundations of the Oroville Dam and Hyatt Powerplant. However, none appeared to be significantly threatening since displacement along the faults would be minimal and unlikely to occur. Landslides around the reservoir rim have occurred since Lake Oroville has been in operation. These landslide do not pose a threat to the freeboard of the dam or the safety of the public. The Department of Water Resources signed contracts for the eventual delivery of 4.23 million acre-feet (MAF) from Lake Oroville. Currently, SWP facilities provide an average of 2.8 MAF with the potential of providing 3.4 MAF by 2010 with existing facilities (additional facilities could provide 4.2 MAF). The main concern for the future operations of Oroville Dam lies in its ability to make efficient water releases to meet increasing water demands. Currently, San Jouquin Valley farmers are receiving 100% of their contract entitlement in non-drought years. However, the South Coast Region is only receiving 60% of its entitlement in wet years (DWR, Bulletin 160, 1993). Based on the 1990 census, the South Coast is projected to increase by 25 million people by 2020, thus increasing water demand by 1.5 MAF. A net water supply deficit of 3.3 MAF to 4.2 MAF is expected in year 2020 (DWR, Bulletin 160, 1993). To meet these shortages, it will require a more efficient operation of water storage facilities. However, governmental regulations now require that more water supply is dedicated to environmental needs. Therefore, one the the future operating challenges for the Oroville Dam is to honor the signed contracts, while maintaining the needed water supply to meet environmental needs. Website designed by Nova Clemenza with additions from a website designed by Wilson Lew.